Morin attributes the shot to a little bit of careful planning and a lot of luck. Still, Morin set himself up for success by avoiding the ‘herd’ mentality common among sports photographers. Look at them, scrambling over each other along the inside of the track to take stereotypical shots—of runners straining towards the finish line against the blurred background of thousands of screaming fans, and of Usain Bolt striking his trademark pose after winning the race. No one thought to shoot from the other side, including the banner lettering at the top of the stadium and the skyline to better capture the downpour—no one except Morin. In addition to his hand-held camera, Morin set up five remote-controlled cameras for varying perspectives of the winner, choosing to focus on Bolt’s lane because “it seemed like a fair bet.” The camera that captured this shot was actually his fifth, set about 30 meters back from the finish line to give a wider view of the stadium.”Without the flash in the sky, it wouldn’t really be anything that special, ” Morin explained modestly, in response to his massive popularity since taking the photo. Indeed, the lightning does add extra ‘zap’ to the shot. 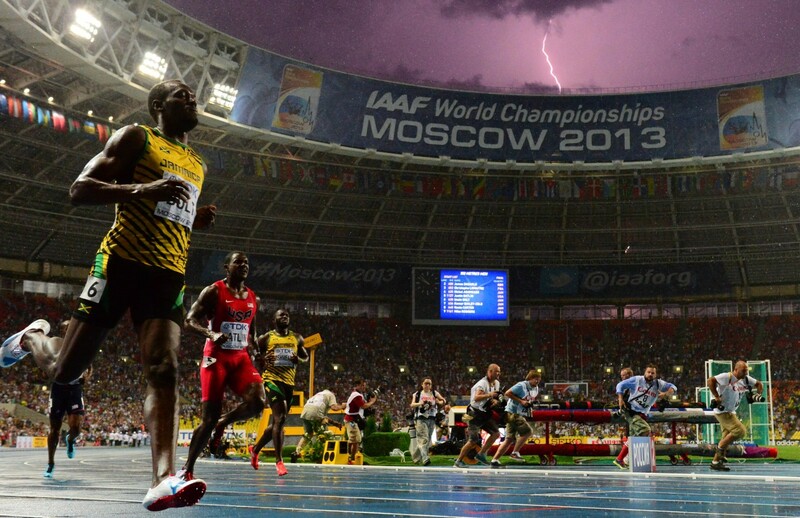 Perhaps that violet flash was a salute from Mother Nature—a respectful nod to celebrate mankind’s own lightning Bolt—or perhaps it was a power trip, reminding us that, while Bolt may be the fastest man in the world, Mother Nature can still beat him to the finish line every time. While we can never know one way or the other, what is clear is that Morin’s careful planning, born from experience and individualism, put him in the right place at the right time.